8 pp. Roman, 617 pp. 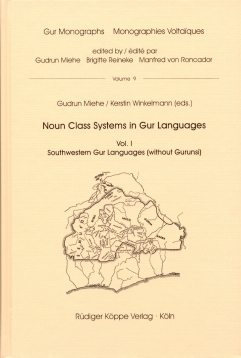 This book is part of a two-volume publication on noun class systems in Gur languages. The present volume contains descriptions of the southwestern Gur languages. As far as their classificatory status is concerned, these are the South Central Gur languages without Gurunsi and most of the other languages classified as probable or improbable Gur by Anthony Naden (1989). In order to facilitate comparison of the data, all contributions follow the same order. Each article starts with some geographic and demographic information, and remarks on the state of linguistic research on the language. The second volume of this publication appeared in 2012 and focuses on the North Central Gur Languages (ISBN 978-3-89645-611-3). Both volumes are available in a set at a reduced price (ISBN 978-3-89645-619-9).